Busy professionals and computer entrepreneurs generally spend most of their time on their personal computers. Syncing and being able to control your mobile phones right from your computer is something which every busy computer professional looks for. 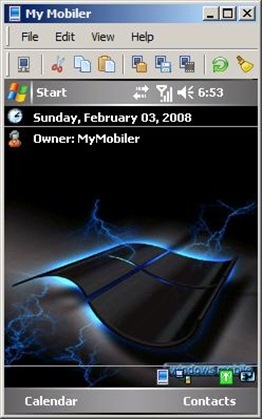 In this article we will tell you how to use a tool called MyMobileR to control your Windows Mobile phone from a computer. 1. View your Windows based mobile phone’s screen right on your desktop (or laptop). 2. Make and receive calls, send and receive texts. 3. Control your mobile by using desktop keyboard and mouse and Copy/Cut/Paste text between mobile and desktop. 4. Capture mobile screen, Drag and drop files to your mobile. MyMobileR can be download both as an Install or a direct ZIP file. If you're using ActiveSync connection on a Windows Mobile version 2005 or later, then enter your IP address as 169.254.2.1. After you are done with reading the article above, you should also read this well compiled list based article on How to do almost anything with MyMobileR and another article on MyMobileR desktop shortcuts.